This image shows the northern part of central New York State, a landscape sculpted by the ice sheets of the last ice age. Lake Ontario runs across the top of the image. The city of Syracuse is the radar-bright area next to the dark Onandaga Lake, below and to the right of the image center. The larger dark area on the right side is Oneida Lake. Several of the Finger Lakes are visible as long narrow dark patches on the left side of the image: Cayuga (north end only), Owasco, Skaneateles, and Otisco (left to right). The city of Auburn is at the north (top) end of Owasco Lake. Between 25,000 and 18,000 years ago, central New York was covered by a vast ice sheet 1,000-1,300 meters (3,300-4,300 feet) thick, similar to the one now covering Greenland. The land shows many marks left by the glaciers. Numerous small, elongated hills rise out of the plains south of Lake Ontario at the top and center of the image. These are drumlins, molded out of sand and clay at the bottom of the ice sheet. 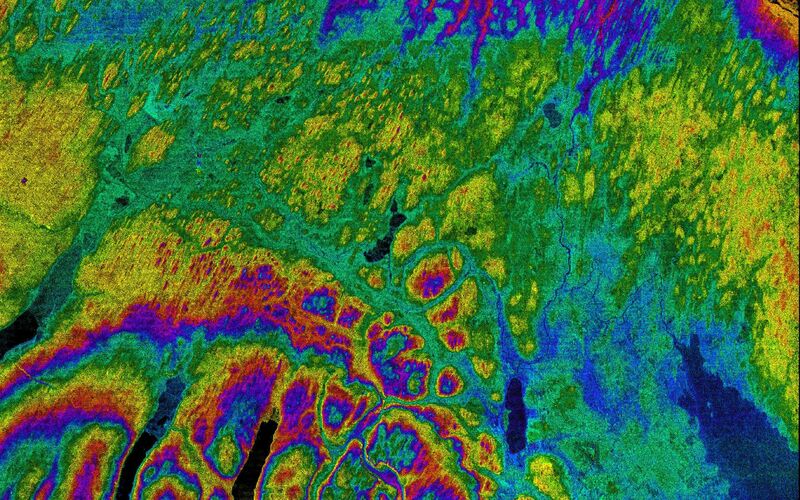 The shape of the drumlins indicates the direction that the ice sheet was moving and varies across the image, providing clues for scientists who study past climatic changes. The hills at the lower left of the image have been carved by the glaciers into "U"-shaped valleys with steep sides and flat bottoms. In several places "dry" valleys cross ridges without a modern river. These were probably carved at a time when the last stages of the glacier blocked rivers from flowing down the big valleys and forced the rivers to cut across the ridges. The wispy features along the shore of Lake Ontario are ice that was floating on the lake when SRTM acquired this image in February. 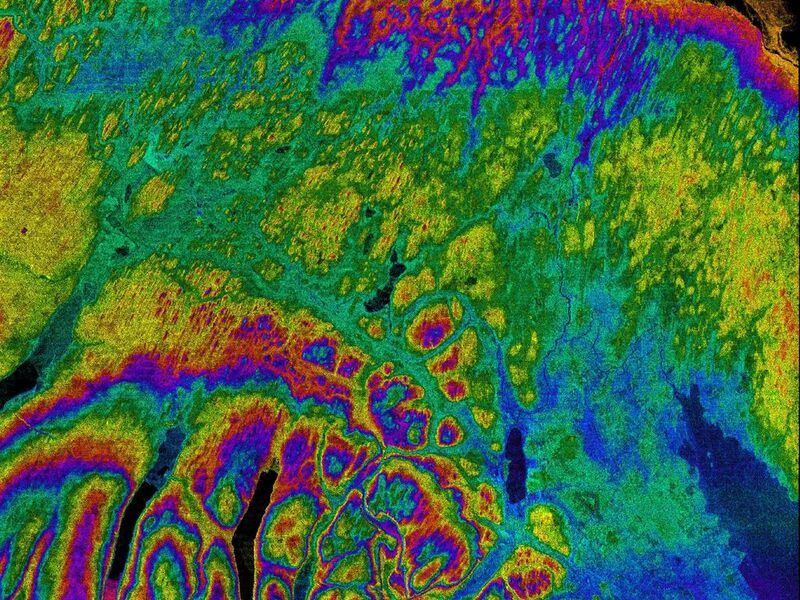 This image combines two types of data from the Shuttle Radar Topography Mission. 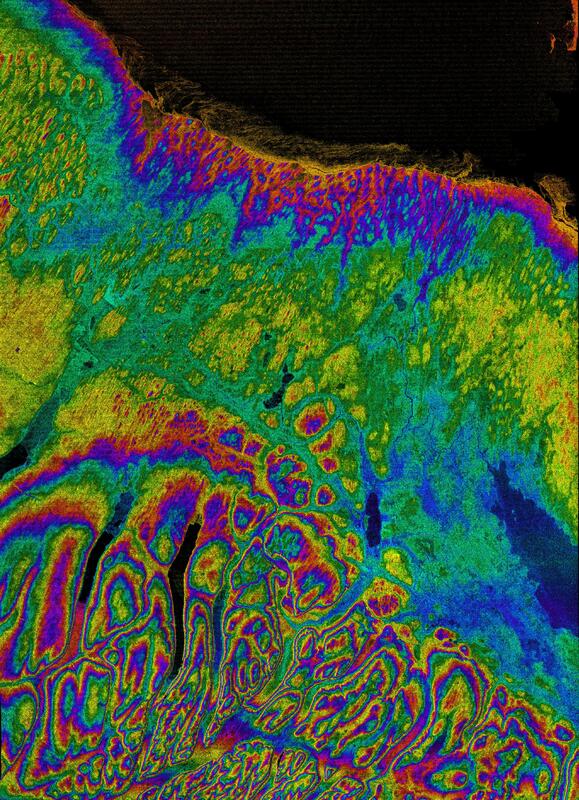 The image brightness corresponds to the strength of the radar signal reflected from the ground, while colors show the elevation as measured by SRTM. Each cycle of colors (from red through green back to red) represents an equal amount of elevation difference similar to contour lines on a standard topographic map. Each color contour represents 100 meters of elevation change. This image was acquired by the Shuttle Radar Topography Mission (SRTM) aboard the Space Shuttle Endeavour, launched on February 11, 2000. SRTM used the same radar instrument that comprised the Spaceborne Imaging Radar-C/X-Band Synthetic Aperture Radar (SIR-C/X-SAR) that flew twice on the Space Shuttle Endeavour in 1994. 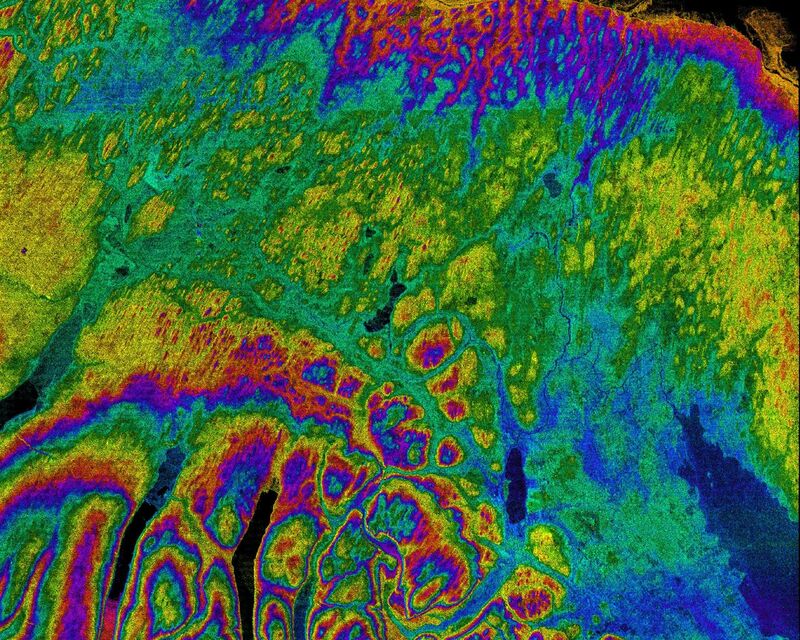 SRTM was designed to collect three-dimensional measurements of the Earth's surface. To collect the 3-D data, engineers added a 60-meter-long (200-foot) mast, installed additional C-band and X-band antennas, and improved tracking and navigation devices. The mission is a cooperative project between the National Aeronautics and Space Administration (NASA), the National Imagery and Mapping Agency (NIMA) of the U.S. Department of Defense (DoD), and the German and Italian space agencies. It is managed by NASA's Jet Propulsion Laboratory, Pasadena, CA, for NASA's Earth Science Enterprise, Washington, DC. Location: 43.0 deg. North lat., 76.3 deg. West lon.